From Monday 5 November 2018, all of the food at the academy will be provided by a new company called Educaterers. We were very keen to improve our food offer and this was the best solution. Quality, quantity and choice will be improved and your child will notice the difference immediately. As part of the switch to Educaterers, we need to move to a cashless system. This means your child will not need to bring money each day but will load an account with money and then use his/her thumb, on a biometric system, to pay for food. You will be able to load his/her account with money, either by putting money in a machine at the Academy or by paying online using ParentPay. We need your permission to allow your son/daughter to have their thumbprint taken. This will only be stored on the academy computer system and provides absolutely no risk at all. For the first two weeks after the holiday we will be able to accept cash, but beyond 19 November all payment for food will be by the biometric system. I know some of you have experienced this in primary schools and it is standard in most secondary schools. This system will allow you to track, via Edulink, what your child is eating and what they are spending on food. I have included some information about the new company and the system. If you have any questions, do not hesitate to contact us. Please return all permission slips by Friday 26 October 2018. 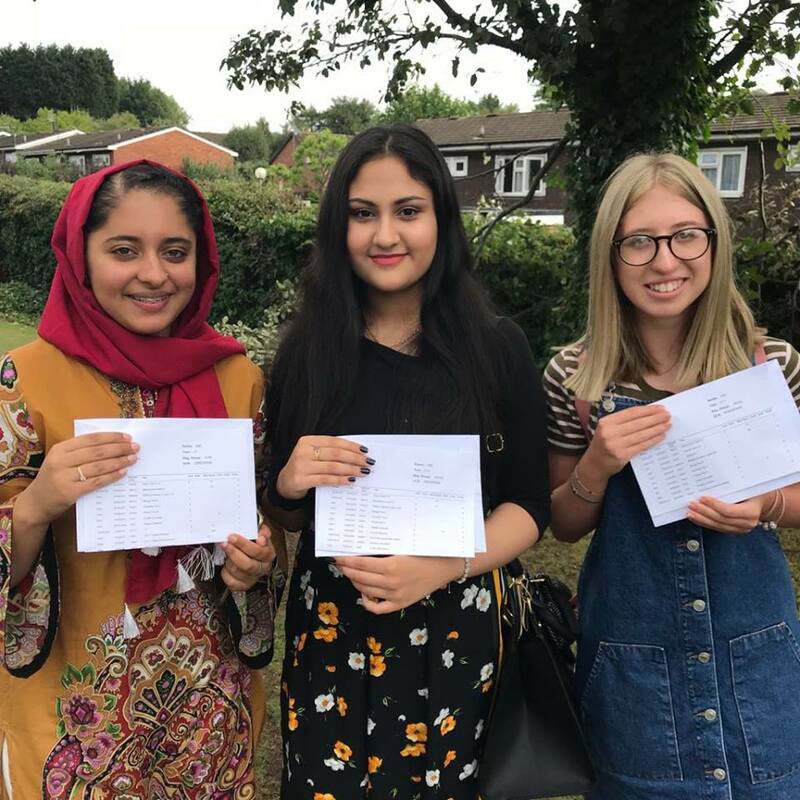 Students and staff at Ormiston Forge Academy in Cradley Heath are celebrating today after collecting their GCSE results – with nearly half of all students achieving Grade 4 or above in English and maths. Overall, more than 47 per cent of students achieved a Grade 4 or above in both English and maths – with a 4 the new grade set by the Government as a pass. In English, 64 per cent of students achieved Grade 4 or above. There has also been a seven-percentage-point increase in the number of students achieving a Grade 5 or above in both English and maths – defined by the Government as a “strong pass” or better. The academy also saw strong attainment in individual subjects including chemistry, where more than half (54%) of students achieved a Grade 7 or above. In BTEC sport, 90 per cent of students earned a Distinction and above. In textiles and religious studies, 75 per cent and 54 per cent of students achieved a ‘good’ pass of Grade 5 or above. “We are delighted that students at Ormiston Forge continue to make strong progress and I’m pleased and incredibly proud of all our students, who have worked so hard to get the grades they need and deserve. “I would like to congratulate all students picking up their grades today. At Ormiston Forge our commitment to supporting our young people and helping them to achieve their full potential is paramount – we will celebrate those who achieve highly and offer support and guidance for those who might be disappointed. Last week students at Forge capped a remarkable year with 85 per cent of the A level cohort achieving three or more passes at grades A*-E. This includes 15 per cent of entries securing the top A* or A grade and over a third of A Level exams undertaken securing an A* to B. The Ormiston Forge Academy Open Days for prospective parents are on Thursday 20th September from 6.00pm–8.30pm and Saturday 22nd September from 9am until 12. Parents and children and invited to come and see Forge and all it has to offer for themselves. GCSE subjects including science, languages, humanities, PE, art have been marked for the first time under the new 1-9 grading system, with 9 being the highest grade. For English and maths, this is the second year the new grading system has been used. New GCSEs are linear in structure rather than modular, with all exams at the end of a two-year course. A grade 4 is effectively an old C grade and the top grade, a grade 9 is the equivalent of very top A*. We’re delighted to be able to announce our open event dates for September. We will be throwing open our doors to prospective students and their parents on Thursday 20th September and Saturday 22nd September. Children who are due to start secondary school in September 2019 and their parents are invited to visit Forge to gain a taster of life at the Academy. Once again, we achieved another set of excellent A level results last summer as well as a first-class set of GCSE results. Visitors will be able to try out science experiments, view paintings, watch our food technology department cook for our modern foreign language cafe, check out our new range of Chromebooks, interact with the geography and history departments and meet our Executive Principal, Mr Burns and Head of School, Dr Mason amongst many other things. Also in attendance will be our football scholars and The Access Project who help our student improve their grades, even more, to get them into a top university. Last year an incredible amount of visitors turned up and our year 7 in 2018 is full so please arrive early and allow around 90 minutes to get the most out of your visit. Attending our open events will give you the opportunity to make the right decision for your child’s education. Students and staff at Ormiston Forge Academy follow excellent A level results last week with more good news. Almost half of the cohort of 150 students achieved a grade 4 in English and maths despite this being the first year of the new more challenging exams in these subjects. Over fifty per cent of students also achieved a C grade or above in all other subjects. Head of academy, Dr Lisa Mason, said: “I’m delighted for the students who have all worked so hard this year to achieve these good results, despite this being the first year of the new tougher exams. Principal, Andrew Burns, said: “Firstly, and most importantly, congratulations to students picking up their grades today. The ones that have done well will get a pat on the back, the ones that are disappointed will be picked up, dusted off, supported and given guidance on next steps. Our commitment to our young people is absolute. Last week students at Forge capped a remarkable year with 84 per cent of the A level cohort achieving three or more passes at grades A*-E. Just 18 months after the Academy was judged as Good by Ofsted and in the same year it was designated as a National Support School, every indicator at Key Stage 5 has improved yet again. We’re delighted to be able to announce our open event dates for September. We will be throwing open our doors to prospective students and their parents on Thursday 21st September and Saturday 23rd September. Children who are due to start secondary school in September 2018 and their parents are invited to visit Forge to gain a taster of life at the Academy. Once again, we achieved another set of excellent A level results last summer as well as a first-class set of GCSE results. Visitors will be able to try out science experiments, view paintings, watch our food technology department cook for our modern foreign language cafe, check out our new range of Chromebooks, interact with the geography and history departments and meet our Principal, Andrew Burns, amongst many other things. Also in attendance will be our City Year team, our Sea Cadets and The Access Project who help our student improve their grades, even more, to get them into a top university. Last year an incredible amount of visitors turned up so please arrive early and allow around 90 minutes to get the most out of your visit. The Principal and staff at Ormiston Forge Academy in Cradley Heath have been selected for a top role supporting schools in challenging circumstances. Andrew Burns is one of more than 70 principals to be appointed to the role of national leader of education (NLE) in the latest recruitment round. NLEs along with staff in their school – designated a national support school (NSS) – use their success and professionalism to provide additional leadership capability in other schools. NLEs are deployed to suit the needs of each school needing support. The type of support provided is flexible and can sometimes involve NLEs becoming executive headteachers. They also have responsibility for developing the next generation of NLEs and national support schools. Principal at Ormiston Forge Academy, Andrew Burns, said: “It’s an incredible honour to receive this designation on behalf of the academy and I am looking forward to supporting other schools on their journey towards improvement. Roger Pope, Chair of the National College for Teaching and Leadership, said: “It’s fantastic that heads like Andrew have the passion and ambition to help improve the life chances of young people, not just in their own but in other schools as well. Stephen Rayner, Chair of Governors at Ormiston Forge Academy, said: “We’re proud of the strength of leadership throughout our academy, but Andrew has a particular ability to recognise and develop the leaders of the future, while always thinking first of the needs of students and communities. As you may know, Ormiston Forge Academy has begun to build a fantastic network of former students who are becoming a great part of school life. This year, we have chosen to work with the charity Future First to help reconnect with even more of our former students. The vision is that our school should be supported by a thriving, engaged alumni community. In addition, we are also looking for older past pupils to keep in touch too! If you, any of your older children, friends or neighbours are former students of the school (Heathfield or Forge), please do pass on the link as we’d love to find out where our former students have gone on to. Last weekend a former student from Forge won the WWE (World Wrestling Entertainment) UK Championship belt. You may not think that I’m a wrestling fan but when a Forge student is involved, I’m always interested. It helps to receive a plethora of messages about the win and it was blanket coverage on social media. Tyler Bate is 19 years old and when competing in the title tournament he was up against opponents bigger than him and opponents who had much more experience than him. Yet, when you watch the footage you can clearly see that Tyler has worked hard and has an incredible amount of talent. In fact, Triple H, 14-Time World Champion and executive vice president of the WWE suggested that Tyler is the future of wrestling. That’s wrestling which has grown to be a multi-billion-dollar sport, a global phenomenon with millions of fans all over the world and a sport that includes some of the most athletically gifted performers on the planet. It’s a sport that has produced names like The Rock, Hulk Hogan and Steve Austin; megastars! Tyler is, and will always be a WWE Champion, the company have shown absolute faith in him and given him this spotlight because he is the best. He’s the best in the UK and it won’t be long before he shows the rest of the world how good he is. At no point during the many hours of hard work he put into his profession did where he came from have a part to play. At no point did anyone in the WWE consider where he came from as an obstacle to his undoubted talent. Being the best was good enough. Being from the Black Country or the West Midlands (the geography will depend on your politics) is NOT an obstacle to success and I hear the excuse all of the time. We teach our students that anything is possible but there is a difference between teaching and showing. Tyler has shown that anything is possible. We’ve had a student this year interviewed for Oxford University, he’s shown that anything is possible. Tyler has shown that age and where you come from isn’t a barrier to success. He’ll inspire Forge students and he’ll inspire young people all over the world, wherever he goes. He’s worked hard and is a leading light for bright young talent in this area. In his interviews, Tyler has shown humility and great pride and we are all incredibly proud of his success. He’s a role model for all of us. Let’s keep putting ourselves on the map!